This vegetable side dish tastes lively and is fast to fix. Makes 5 servings. 1 cup per serving. Add oregano and garlic, and sauté for about 2 minutes. 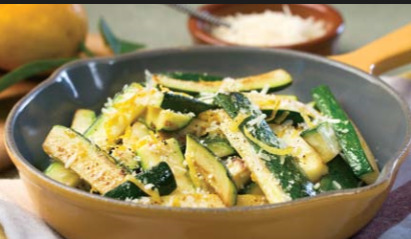 Add zucchini and lemon peel, and sauté for about 3 minutes until zucchini is lightly browned. Mix in Parmesan cheese and pepper. Serve warm.